Ghanaian midfielder, Elizabeth Addo has expressed excitement after completing Junning Sunning move. The Black Queens skipper signed a year deal with the club after leaving the United States. The midfielder parted ways with USA side Seattle Reign in February paving way for her move to the Asian nation. 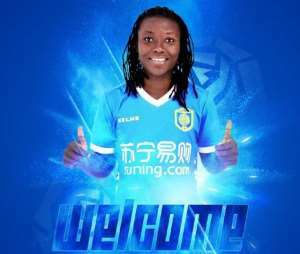 The 26-year old becomes the fourth African player to move to the Chinese Women's Super League in 2019. She joins South Africa duo Linda Motlhalo and Chrestinah Thembi Kgatlana and Nigeria's Francisca Ordega. Addo was named in the Best XI of the 2018 Women's AFCON despite exiting the group stage.